Last October, on the heels of the UN General Assembly agreeing to the Sustainable Development Goals, the global health community met in Mexico City to discuss strategy for achieving the “grand convergence”: finally bridging the gap between maternal and newborn health in rich and poor countries. Significant strides have been made in reducing maternal deaths, from 380 maternal deaths per 100,000 live births in 1990 to 210 in 2013. But “we all know in this community there are still too many mothers and too many babies dying,” said Pablos-Méndez. Three quarters of maternal deaths are preventable, caused by complications such as severe bleeding, infections, high blood pressure, and unsafe abortion. The Global Maternal Newborn Health Conference gathered more than 1,000 policymakers, researchers, practitioners, and advocates from all over the world to discuss existing challenges in reaching under-served women and practical solutions. “Quality, integration, and equity” were the primary themes. This spring, the Women Deliver conference will continue the conversation in Copenhagen. What’s needed to carry on momentum? What lessons have been learned? Where do we go next? The Millennium Development Goals, agreed upon in 2000, spurred a number of improvements to maternal health interventions, but problems persist, such as inequality and poor quality of care. To discuss solutions to these problems in the successors to the MDGs, the Sustainable Development Goals (SDGs), delegates from 75 countries gathered in Mexico City. The event was a significant milestone – “the first gathering of maternal and newborn colleagues together to discuss how to accelerate progress for mothers and babies,” said Joy Riggs-Perla, director of Save the Children and co-chair of the Global Maternal Newborn Health Conference. The fact that it took place in Mexico – a country that has made significant strides in improving maternal and newborn health – was also significant, said Pablos-Méndez, proving change can happen quickly. Dr. Mariam Claeson, director of the Bill and Melinda Gates Foundation, said she is happy to see positive movement. One of the most prominent is investment in the quality of labors and deliveries. It really provides “quadruple benefits,” she said, reducing maternal and newborn mortality, reducing and preventing stillbirths, and reducing and preventing disability. Other recent changes include increased focus on measurement and financing. There’s an estimated $30 billion funding gap for maternal and child health programs every year, said Pablos-Méndez. The Global Financing Facility, a new instrument created by the World Bank, will play a crucial role in raising more funds. Incorporating private and public finance flows worldwide, the facility does not simply transfer money from donors to developing countries as countries submit proposals, but will instead mobilize funds based country needs, which will be assessed through case investigation. This novel mechanism is intended to improve consistency across programs as well and reward results. More than a billion trust funds have already been set up and are ready to flow into countries with significant funding gaps for reproductive, maternal, newborn, child, and adolescent health, said Pablos-Méndez. Through the facility, developing countries are able to “borrow from the future to save lives now,” he said. In India, several recent programs have helped significantly reduce maternal and newborn deaths, said Jyoti Benawri, state program manager of Jhpiego. One is the birth-companion initiative, which allows a female companion of the mother inside the labor room to comfort, reassure, and praise her. The presence of a female relative has proved beneficial to the laboring mother in terms of reducing stress. The panelists also discussed outstanding problems that might be touched on in Copenhagen. Dr. Peter Waiswa, a lecturer at Makerere University in Kampala, said that while critical in assessing service gaps and measuring outcomes, “data can tell lies.” There is much more national and global level data available than local and specialized data, he said, which can hide inequities within countries and different demographics. Additionally, data should always be interpreted in context. For example, most maternal mortalities occur after 4 pm, especially on weekends, said Waiswa. The data gives little hint at why, however, which he said is in part because senior health workers do not want to work after regular hours, which leads to less supervision and fewer experience staff during those times. Another concern regarding maternal and newborn health data is its complexity. Many times data is very technical and only understandable to NGO workers, doctors, and researchers. “It’s never interpreted – you don’t know what it means, even the local leaders will not understand it,” said Kizza. There are few channels to effectively convey information between researchers and others, she said. Making data more accessible is also important to hold governments accountable to the goals and targets they have committed to under the SDGs. According to Kizza, many women in the most at-risk areas have superficial knowledge of maternal and newborn health. “Some of them think if they only go there and have the chat, that is enough,” she said – the value of follow-ups and regular visits are not well understood. Education is therefore another area where more effort is needed. Ordinary citizens need to know their rights, what mothers should do and not do during pregnancy, and the services available at health facilities, she said. Even with continuing challenges, Dr. Ana Langer, Director of the Women and Health Initiative and Maternal Health Task Force at Harvard T.H. Chan School of Public Health, emphasized the need to generate solutions rather than rehash problems at the upcoming conference in Copenhagen. One of the goals will be to expand the conversation beyond mortality to morbidities, stillbirths, and child development. Claeson asked the health sector, private sector, and governments to imagine a future that provides user-centric, woman-focused health services to all mothers and newborns. “I think the biggest risk, frankly, for all of us, is staying focused,” she said, and keeping other sectors focused on women and newborns too. Sources: Global Financing Facility, The Guardian, Maternal Health Task Force, Ministry of Health and Family Welfare (India), PLOS, Save the Mothers, World Bank, World Health Organization. 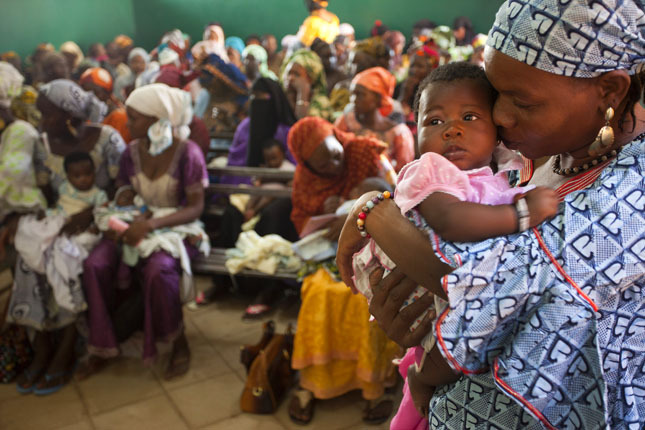 Photo Credit: Mothers wait to vaccinate their babies in Bamako, Mali, courtesy of Dominic Chavez/World Bank. This post originally appeared on New Security Beat.